Located at the 36 rue Pierre Demours in the 17th district of Paris, to the west of the capital, the Hotel Westside offers a remarkable situation. Close to the Congress Centre Porte Maillot and to the Office District La Defense, the Hotel is only a ten minutes walk from Etoile, the Arc de Triomphe place where the Champs-Elysées Avenue starts. The Hotel is located in a particularly quiet one-way street among remarkable Haussmann style buildings. Furthermore, this « chic » part of the 17th district offers many bars, restaurants and shops and a fantastic «village » atmosphere which is friendly and in full renewal. The typical Poncelet market attracts many visitors fond of the french way of life : excellency of the products (fruits, vegetables, cheeses) and a very pleasant provincial atmosphere with merchants shouting through the street. 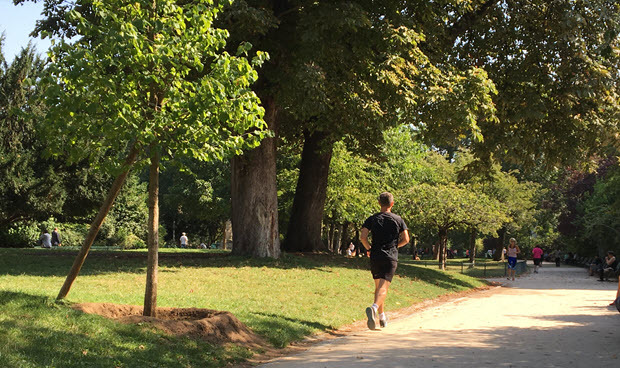 Parc Monceau, one of the finest parisian green parks, can be reached in ten minutes : trails for runners (picture) and playgrounds for children are available. Dining will be the easiest part : many fine restaurants surround Westside Hotel from the typical French ‘bouchon lyonnais’ Chez Fred, the famous parisian brasserie La Lorraine (place des Ternes) to small french bistronomique restaurants like le 18, rue Bayen, or trendy places like Môm at the end of rue Demours. Excellent italian La Famiglia. Seafood lovers will find delicious oysters at Le Bar à Huîtres (avenue de Wagram) or at L’Huitrier (Rue Saussier Leroy). Two of the best fish restaurants in Paris are also at walking distance : Dessirier (Place du Maréchal Juin) and Rech (Avenue des Ternes). As gastronomy is concerned, Michelin stared Frederic Simonin’s restaurant or Le Rital can be reached in less than 3 minutes from the hotel. Affordable french food restaurants are also available : we recommend Au Petit Marguery (avenue des Ternes), L’Hortensia (place du Maréchal Juin), Les Caves Petrissans (avenue Niel) or L’Aligot or Schwartz’s Deli (both avenue Niel too). Fine Asian meals are available at L’Orchidée Thaï (rue Laugier) or Chez Ly (Avenue Niel). 38, avenue des Ternes, Paris 17ème (5 mn walk). 38 € per day. Located at the 36 RUE PIERRE DEMOURS in the 17th district of Paris, to the west of the capital, the Hotel Westside offers a remarkable situation. Close to the Congress Centre Porte Maillot and La Defense, the Hotel is only a ten minutes walk from Etoile, the Arc de Triomphe place. It is located in a particularly quiet one-way street. Furthermore, this « chic » part of the 17th district offers many bars, restaurants and shops and a fantastic «village » atmosphere which is friendly and in full renewal. ©2013 Hôtel Westside. All rights reserved.